The Pigs are on tour this Spring through Summer. Trekking from the Crooked Mountain Concert in the Warrumbungles to the annual Tamworth Country Music Festival. Planned stops on the tour include Melbourne, Shellharbour (NSW) , St. Arnaud (Vic), Narooma (NSW), Katoomba (NSW), Orange (NSW), Ballarat (Vic), Bathurst (NSW), Gold Coast (QLD), Canberra (ACT). More Queensland dates to be announced. In their own words: the misunderstood family band The Pigs play hillbilly pop and all things good. With a tempered history spanning 4 albums, one EP, Golden Guitar Nominations, world tours and sore feet, the band is known for its dynamic and entertaining live performances. 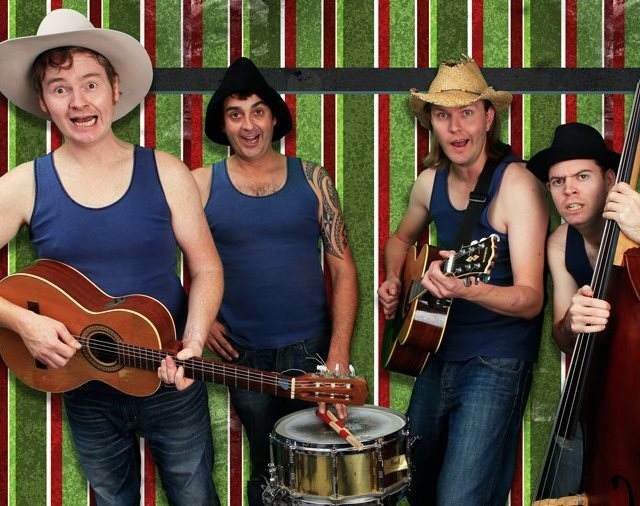 T-Bone, Stretch, Cousin Shamus, Cousin Montz and Cousin Bert will perform crowd-favourite tunes from 12 Years on the road. With double bass, acoustic guitars, mandolin, stand up drums, banjo and big bluegrass vocal harmonies, The Pigs’ barefoot-genre-bending-energy appeals to just about anybody with a pulse. Need tunes to play on your Radio Show? Email The Pigs . 5 November 2016 – Warrumbungle National Park. 11 November 2016 – Thornbury, Melbourne, VIC, Thornbury Theatre. 19 November 2016 – Narooma, NSW, Quarterdeck. 25 January 2017 – Tamworth Country Music Festival, Capitol Theatre. More dates to come. Check their website for tickets and more dates.